Harvey John Wix when serving in the Royal Navy as a CPO Chef. Harvey John Wix was born in Bury St Edmunds on 11th June 1882. His family moved to Wivenhoe and were involved with the maritime life of the village for many years. Harvey John Wix was a cook on board various yachts from about 1900 onwards, serving in the Altair, Karen, Sapphire, Dolphin, and Heartsease. Eventually he found a position as the owner’s chef on the Vanessa belonging to the Bowlby family. When the Vanessa went to war in October 1914, it is very likely that he stayed with her as officers’ chef as she would probably have been serving as the Senior Officer’s ship for a flotilla of auxiliary patrol vessels. In August 1917 he was Officers’ Chief Chef in H.M.S. Colossus in the 4th Battle Squadron of the Grand Fleet, as chef to Admiral Keyes. He went from the Colossus to H.M.S. Pembroke which was the nominal base ship at Chatham Dockyard, but this was only for a very short time, 25 days, so he was no doubt, simply waiting for his new ship, the monitor H.M.S. Prince Rupert. 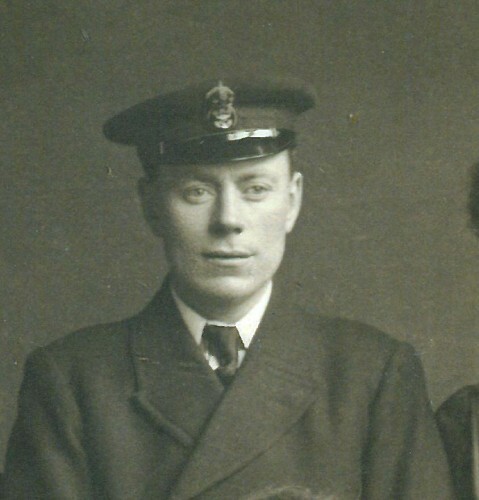 He served in Prince Rupert from Oct. 1917 until May 1918 when he became Officers’ Chief Chef in the cruiser H.M.S. Birmingham. In March 1919 he was transferred to the battlecruiser H.M.S. Lion. From the Lion, in April 1920, he went to the brand new pride of the fleet, H.M.S. Hood, but he was not to stay with her for long as he soon found himself in the R. N. Hospital at Chatham and was invalided out of the Navy on 22nd Sept. 1920. He and his wife opened the first fish & chip shop in Wivenhoe, in Hamilton Road. Harvey Wix, the grandfather of Hilary and Tim Wix, worked for my uncle, Bill Cracknell, at the local East Essex bakery (now the Bakehouse Restaurant) during WW2 as one of his bakery staff comprising Charlie Taylor, Bert Sawyers and Frank Warren who were serving in the Forces.